Mars-Chroniken - EINE EISIGE FATA MORGANA? Mars-Chroniken - Mars probe poised to solve red planet’s methane mystery Researchers hope European–Russian Trace Gas Orbiter will end a long-running debate over source of the gas on Mars. Astronomie - Am Niederrhein und im Saarland schlugen einst Meteoriten ein. Deutsche Forscher haben jetzt alle Hinweise zusammengetragen und die genauen Einschlagstellen identifiziert. The ALMA and APEX telescopes have peered deep into space — back to the time when the Universe was one tenth of its current age — and witnessed the beginnings of gargantuan cosmic pileups: the impending collisions of young, starburst galaxies. Astronomers thought that these events occurred around three billion years after the Big Bang, so they were surprised when the new observations revealed them happening when the Universe was only half that age! These ancient systems of galaxies are thought to be building the most massive structures in the known Universe: galaxy clusters. Using the Atacama Large Millimeter/submillimeter Array (ALMA) and the Atacama Pathfinder Experiment (APEX), two international teams of scientists led by Tim Miller from Dalhousie University in Canada and Yale University in the US and Iván Oteo from the University of Edinburgh, United Kingdom, have uncovered startlingly dense concentrations of galaxies that are poised to merge, forming the cores of what will eventually become colossal galaxy clusters. Peering 90% of the way across the observable Universe, the Miller team observed a galaxy protocluster named SPT2349-56. The light from this object began travelling to us when the Universe was about a tenth of its current age. The individual galaxies in this dense cosmic pileup are starburst galaxies and the concentration of vigorous star formation in such a compact region makes this by far the most active region ever observed in the young Universe. Thousands of stars are born there every year, compared to just one in our own Milky Way. The Oteo team discovered a similar megamerger formed by ten dusty star-forming galaxies, nicknamed a “dusty red core” because of its very red colour, by combining observations from ALMA and the APEX. These forming galaxy clusters were first spotted as faint smudges of light, using the South Pole Telescope and the Herschel Space Observatory. Subsequent ALMA and APEX observations showed that they had unusual structure and confirmed that their light originated much earlier than expected — only 1.5 billion years after the Big Bang. The new high-resolution ALMA observations finally revealed that the two faint glows are not single objects, but are actually composed of fourteen and ten individual massive galaxies respectively, each within a radius comparable to the distance between the Milky Way and the neighbouring Magellanic Clouds. "These discoveries by ALMA are only the tip of the iceberg. Additional observations with the APEX telescope show that the real number of star-forming galaxies is likely even three times higher. Ongoing observations with the MUSE instrument on ESO’s VLT are also identifying additional galaxies,” comments Carlos De Breuck, ESO astronomer. Current theoretical and computer models suggest that protoclusters as massive as these should have taken much longer to evolve. By using data from ALMA, with its superior resolution and sensitivity, as input to sophisticated computer simulations, the researchers are able to study cluster formation less than 1.5 billion years after the Big Bang. 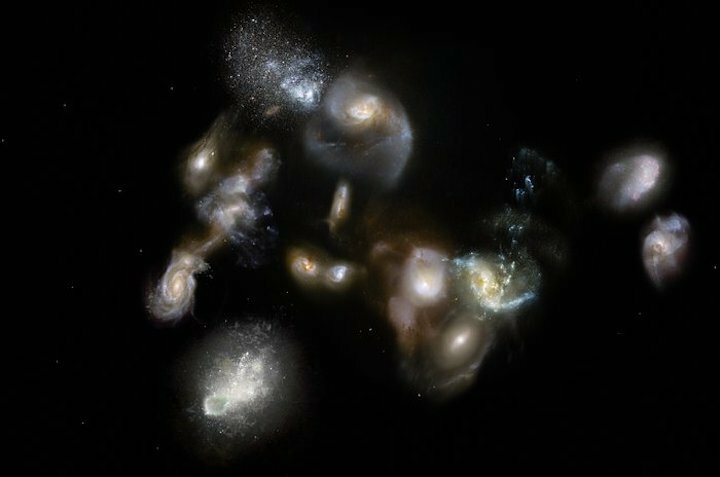 "How this assembly of galaxies got so big so fast is a mystery. It wasn’t built up gradually over billions of years, as astronomers might expect. This discovery provides a great opportunity to study how massive galaxies came together to build enormous galaxy clusters," says Tim Miller, a PhD candidate at Yale University and lead author of one of the papers. This research was presented in two papers, “The Formation of a Massive Galaxy Cluster Core at z = 4.3”, by T. Miller et al., to appear in the journal Nature, and “An Extreme Proto-cluster of Luminous Dusty Starbursts in the Early Universe”, by I. Oteo et al., which appeared in the Astrophysical Journal. The Miller team is composed of: T. B. Miller (Dalhousie University, Halifax, Canada; Yale University, New Haven, Connecticut, USA), S. C. Chapman (Dalhousie University, Halifax, Canada; Institute of Astronomy, Cambridge, UK), M. Aravena (Universidad Diego Portales, Santiago, Chile), M. L. N. Ashby (Harvard-Smithsonian Center for Astrophysics, Cambridge, Massachusetts, USA), C. C. Hayward (Harvard-Smithsonian Center for Astrophysics, Cambridge, Massachusetts, USA; Center for Computational Astrophysics, Flatiron Institute, New York, New York, USA), J. D. Vieira (University of Illinois, Urbana, Illinois, USA), A. Weiß (Max-Planck-Institut für Radioastronomie, Bonn, Germany), A. Babul (University of Victoria, Victoria, Canada) , M. Béthermin (Aix-Marseille Université, CNRS, LAM, Laboratoire d’Astrophysique de Marseille, Marseille, France), C. M. Bradford (California Institute of Technology, Pasadena, California, USA; Jet Propulsion Laboratory, Pasadena, California, USA), M. Brodwin (University of Missouri, Kansas City, Missouri, USA), J. E. Carlstrom (University of Chicago, Chicago, Illinois USA), Chian-Chou Chen (ESO, Garching, Germany), D. J. M. Cunningham (Dalhousie University, Halifax, Canada; Saint Mary’s University, Halifax, Nova Scotia, Canada), C. De Breuck (ESO, Garching, Germany), A. H. Gonzalez (University of Florida, Gainesville, Florida, USA), T. R. Greve (University College London, Gower Street, London, UK), Y. Hezaveh (Stanford University, Stanford, California, USA), K. Lacaille (Dalhousie University, Halifax, Canada; McMaster University, Hamilton, Canada), K. C. Litke (Steward Observatory, University of Arizona, Tucson, Arizona, USA), J. Ma (University of Florida, Gainesville, Florida, USA), M. Malkan (University of California, Los Angeles, California, USA) , D. P. Marrone (Steward Observatory, University of Arizona, Tucson, Arizona, USA), W. Morningstar (Stanford University, Stanford, California, USA), E. J. Murphy (National Radio Astronomy Observatory, Charlottesville, Virginia, USA), D. Narayanan (University of Florida, Gainesville, Florida, USA), E. Pass (Dalhousie University, Halifax, Canada), University of Waterloo, Waterloo, Canada), R. Perry (Dalhousie University, Halifax, Canada), K. A. Phadke (University of Illinois, Urbana, Illinois, USA), K. M. Rotermund (Dalhousie University, Halifax, Canada), J. Simpson (University of Edinburgh, Royal Observatory, Blackford Hill, Edinburgh; Durham University, Durham, UK), J. S. Spilker (Steward Observatory, University of Arizona, Tucson, Arizona, USA), J. Sreevani (University of Illinois, Urbana, Illinois, USA), A. A. Stark (Harvard-Smithsonian Center for Astrophysics, Cambridge, Massachusetts, USA), M. L. Strandet (Max-Planck-Institut für Radioastronomie, Bonn, Germany) and A. L. Strom (Observatories of The Carnegie Institution for Science, Pasadena, California, USA). The Oteo team is composed of: I. Oteo (Institute for Astronomy, University of Edinburgh, Royal Observatory, Edinburgh, UK; ESO, Garching, Germany), R. J. Ivison (ESO, Garching, Germany; Institute for Astronomy, University of Edinburgh, Royal Observatory, Edinburgh, UK), L. Dunne (Institute for Astronomy, University of Edinburgh, Royal Observatory, Edinburgh, UK; Cardiff University, Cardiff, UK), A. Manilla-Robles (ESO, Garching, Germany; University of Canterbury, Christchurch, New Zealand), S. Maddox (Institute for Astronomy, University of Edinburgh, Royal Observatory, Edinburgh, UK; Cardiff University, Cardiff, UK), A. J. R. Lewis (Institute for Astronomy, University of Edinburgh, Royal Observatory, Edinburgh, UK), G. de Zotti (INAF-Osservatorio Astronomico di Padova, Padova, Italy), M. Bremer (University of Bristol, Tyndall Avenue, Bristol, UK), D. L. Clements (Imperial College, London, UK), A. Cooray (University of California, Irvine, California, USA), H. Dannerbauer (Instituto de Astrofíısica de Canarias, La Laguna, Tenerife, Spain; Universidad de La Laguna, Dpto. Astrofísica, La Laguna, Tenerife, Spain), S. Eales (Cardiff University, Cardiff, UK), J. Greenslade (Imperial College, London, UK), A. Omont (CNRS, Institut d’Astrophysique de Paris, Paris, France; UPMC Univ. Paris 06, Paris, France), I. Perez–Fournón (University of California, Irvine, California, USA; Instituto de Astrofísica de Canarias, La Laguna, Tenerife, Spain), D. Riechers (Cornell University, Space Sciences Building, Ithaca, New York, USA), D. Scott (University of British Columbia, Vancouver, Canada), P. van der Werf (Leiden Observatory, Leiden University, Leiden, The Netherlands), A. Weiß (Max-Planck-Institut für Radioastronomie, Bonn, Germany) and Z-Y. Zhang (Institute for Astronomy, University of Edinburgh, Royal Observatory, Edinburgh, UK; ESO, Garching, Germany). ESO is the foremost intergovernmental astronomy organisation in Europe and the world’s most productive ground-based astronomical observatory by far. It has 15 Member States: Austria, Belgium, the Czech Republic, Denmark, France, Finland, Germany, Italy, the Netherlands, Poland, Portugal, Spain, Sweden, Switzerland and the United Kingdom, along with the host state of Chile and with Australia as a strategic partner. ESO carries out an ambitious programme focused on the design, construction and operation of powerful ground-based observing facilities enabling astronomers to make important scientific discoveries. ESO also plays a leading role in promoting and organising cooperation in astronomical research. ESO operates three unique world-class observing sites in Chile: La Silla, Paranal and Chajnantor. At Paranal, ESO operates the Very Large Telescope and its world-leading Very Large Telescope Interferometer as well as two survey telescopes, VISTA working in the infrared and the visible-light VLT Survey Telescope. ESO is also a major partner in two facilities on Chajnantor, APEX and ALMA, the largest astronomical project in existence. And on Cerro Armazones, close to Paranal, ESO is building the 39-metre Extremely Large Telescope, the ELT, which will become “the world’s biggest eye on the sky”. This montage shows three views of the distant group of interacting and merging galaxies called SPT2349-56. The left image is a wide view from the South Pole Telescope that reveals just a bright spot. The central view is from Atacama Pathfinder Experiment (APEX) that reveals more details. The right picture is from the Atacama Large Millimeter/submillimeter Array (ALMA) and reveals that the object is actually a group of 14 merging galaxies in the process of forming a galaxy cluster.